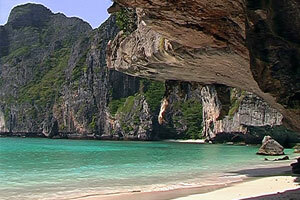 It would be a shame to stay in Phi Phi without swimming in the clear waters of Maya Bay. 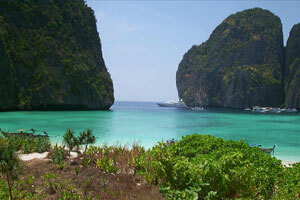 Located on the small island of Phi Phi Leh, this nature reserve is accessible only by long tail boat from Ton Sai Bay. Made famous by Danny Boyle's film "The Beach" Maya Bay keeps its promise with an idyllic beach concealed by high cliffs that ring the cove. But the popularity of Maya Bay has a bad consequence: the beach is literally full of holidaymakers. Its turquoise waters are invaded by boats and it's no longer the paradise it used to be. You have two choices: either you get up early to enjoy Maya Bay as Leonardo DiCaprio, or you spend the night on a boat!